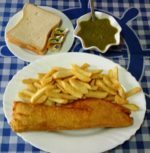 Short Business Description: The best Fish & Chips in Cyprus, to Eat in or Take away. Short Business Description: Restaurant and Cocktail Bar Open Tuesday to Sunday from 9:30am to midnight. Short Business Description: In a beautiful location on the beach. We are a family run traditional fish Tavern offering expertly cooked “Catch of the Day” or try one of our famous Mezes. Short Business Description: Scottish Owned Pub. Live coverage of Premiership football matches. Karaoke every night. Short Business Description: Quality deli food and home made cakes. Coffees and teas of varieties.The platters, salads and sandwiches are made up from the deli cold meats and cheeses. There are vegetarian options.